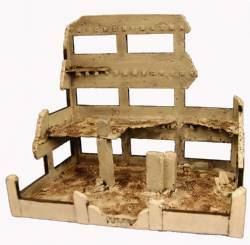 15mm scale - Includes five straight wall sections, one ruined wall section, one gate, one arch, and one fountain Resin cast for strength and superb detail. Comes painted as shown. Wall sections are 3"x1". 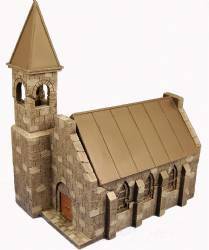 15mm scale - One Town Church. Church is convertible to ruined version by lifting off the upper portion of the building and removing the steeple. Resin cast for strength and superb detail. Comes painted and assembled as shown. 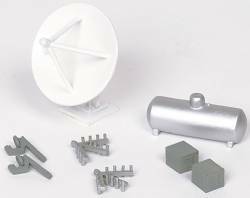 15mm scale � This is a large set. It comes with seven buildings/structures. 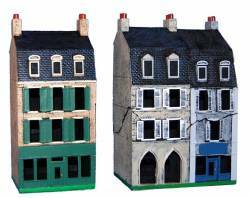 The upper portions on the larger buildings are removable which converts the lower half into a ruined version of the building. Resin cast for strength and superb detail. Comes painted and assembled as shown. Includes Main Station Building, Switch Tower, 3 out buildings, Water cooling tower, and double building. 15mm scale - Comes painted and assembled. Removable upper portion of the building creates ruined version of this buiding and gives you access to the interior. Package comes with 2 buildings. 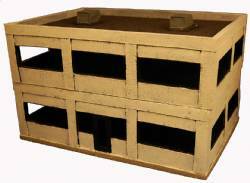 For dioramas and games with 15mm figures Resin cast for strength and superb detail.